My intention with each of these posts is that you’re challenged to interrupt the noise and routine in your life, just for a moment, to think more deeply about what really matters in life… your relationship with yourself and with others in your professional and personal life. It was very busy at my local IGA yesterday with all the checkouts at least 3 deep and the ‘express’ checkout about 12 deep. I had a basket full of groceries and was now next in line, when I noticed the person who was lined up behind me only had a loaf of bread to pay for. It was a no-brainer for me to simply say “Why don’t you go ahead of me, you’ve only got the bread.” With a big smile and a thank you, the customer paid for the bread and left. Now I’m not sharing this with you to point out how courteous I am, as I said, it was just a no-brainer for me to let the other person go first, but it did get me thinking about common courtesy, and whether it is such a common thing these days? Here’s a challenge for you. In this world of ‘tap and go’, take notice over the next few days how often you see other people being courteous to each other. Reciprocity in its most simple form can be expressed as ‘You get back what you give out’. While it might seem that I got nothing back by letting the other person go before me at the checkout, I actually did. I got a small boost in my sense of well-being through a heightened sense of self-trust. Emotions like pride, satisfaction, positivity, and a sense of belonging and meaning in life were all momentarily boosted. Now you might think I’m over-thinking this small act of kindness, but science backs up my point of view. The results of a meta-study of the impact of random acts of kindness1 found there is a ‘small to medium’ positive impact on well-being. In this disruptive, fast-paced, high-stress world that many of us are experiencing, surely any boost in our well-being and sense of life satisfaction is good. The really good news is it doesn’t take a lot to get these small boosts to our well-being throughout any day… just be a bit more courteous. Aristotle teaches us that our actions and our behaviours are our morals shown in conduct. What are your actions and behaviours telling the world about who you are – your courteous nature, your strength of character, your morals and values? To bring more trust into your life, a great place to start is with intentional common courtesy. How courteous are the people in your professional and personal life roles toward you? Remember what you give out you get back. 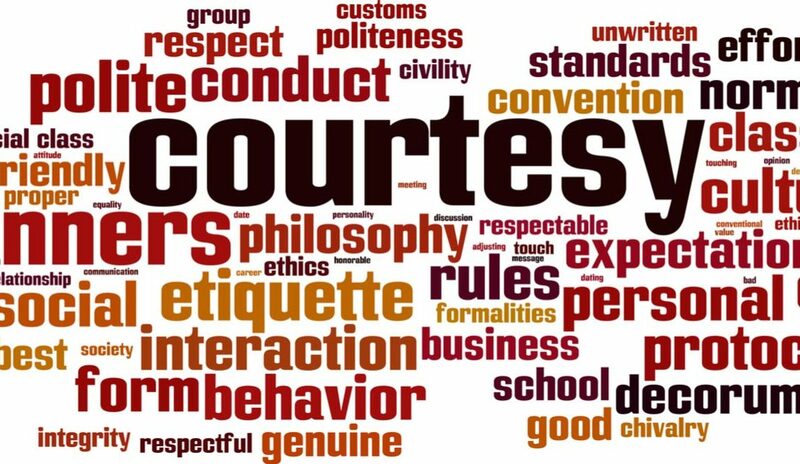 In what ways could you be more intentionally courteous toward others? Is common courtesy etched into the fabric of your personal character? Intentionally acting on being more courteous toward others will help you develop your own sense of confidence for self-trust, your courage to trust others, and your combined sense of character and competence required to earn others’ trust. Being more intentional about being more courteous could be as simple as respecting others’ time. Turning up late without notice or reason, other than you’re running late, simply isn’t courteous nor is it respectful. Speaking over top of someone while they are talking; ignoring or waving off someone’s idea or suggestion; sarcasm; being distracted during a conversation; paying more attention to incoming messages on your smart phone; not replying to email requests or returning phone calls … each of these, in context, are examples of a lack of intentional courtesy. My best to you for now, and remember when you intentionally improve the life of others in your professional and personal relationships, you set up the power of reciprocity … what you give out, you get back.